Burning the Devil or La Quema del Diablo is a tradition held every December 7, at 6:00 in the evening sharp, families build bonfires outside their homes and burn effigy of Satan. It is a tradition that many Guatemalans take part as a way to cleanse their home from devils that lurk in their home, creeping behind the furniture or hiding under the bed. La quema del diablo can be traced to colonial time, a tradition that started since the 18th century. Held on the eve of the Feast of the Immaculate Conception and as a prelude to holiday season, those who could afford it adorns the fronts of their houses with lanterns, but for those who have lesser means builds a bonfires from their trash to celebrate the occasion. A symbolical tradition with a belief that the fire burns the devil serves as purifying element, as the Virgin Mary was the blessed one to conceive baby Jesus must be free from any form of evil, therefore the event serves as “burning the devil” to clear the way for Mary’s feast. Though the celebration may sound fun, it is controversial especially for the environmentalist groups. Back in the days, mostly paper were burned for the “cleansing ritual”, but now, piles of rubbish are mostly made of plastic and rubber that causes air pollution. The Ministry of the Environment and Natural Resources released a widely publicized statement back in 2008 a warning that one hour of bonfire containing rubber and plastic is equal to the carbon dioxide produced by a million and a half cars in circulation at the same time. Over time the tradition evolved, from burning piles of garbage and pieces of furniture to being replaced by the effigy of Satan in a form of piñatas. The tradition has special significance in Guatemala City because of its anticipation of Feast of the Immaculate Conception, the patron saint of the city. Along the street of Zona 1, the historic city center, many vendors pile the street selling stuffs associated with La Quema del Diablo, from firecrackers to simple and intricate devil piñatas. In different parts of the city, people celebrates and burns their own devil piñatas. The tradition continues, as the idea is to burn all the bad from the previous year and to start anew from the ashes. It is widely observed throughout the country, The Devil is burned at the stroke of six. 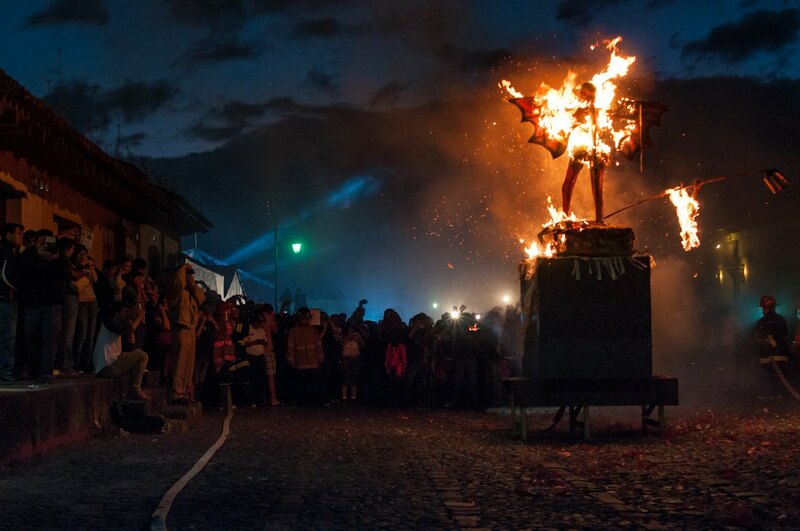 In Antigua, the former capital of the country, a devil three stories tall is constructed and burned in the city square. A controversial tradition yet very significant among Guatemalans, a hope of devil free nation, of a harmonious Guatemala. Make sure to subscribe to The Mixed Culture mailing list to get and read my latest adventure straight from your inbox. Or, follow me on Facebook or Instagram to know the scoop from The Mixed Culture. Feel free to email me should you have any questions or comment below.